And here we are back to the holiday recipe series! Today we are focusing on one of my favorite parts of a Thanksgiving meal — the stuffing!! Some people call it stuffing, some people call it dressing, I call it heaven on a plate! But seriously, my family calls it stuffing regardless of whether it actually gets stuffed into a bird. This Sourdough Stuffing with Apples and Bacon was not actually stuffed into a turkey, but feel free to do that if you want. Keep in mind though, you’ll end up with a moister bird if you bake your stuffing/dressing outside the turkey because the breast meat starts to dry out before the stuffing reaches a safe temperature. That being said, I still have a tendency to stuff a turkey because that’s just the way we’ve always done it in my family. 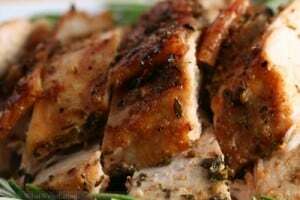 It just doesn’t feel like Thanksgiving without dry turkey and moist stuffing! This sourdough stuffing is something I made during the big pre-holiday feast that Amanda and I created a while back. We had dueling stuffings that day as Amanda made a delicious Cornbread and Garlic Sausage Stuffing (er, Dressing? ), while I decided to make use of a couple loaves of stale homemade sourdough. Sourdough bread is actually perfect for stuffing because it does stale very quickly! This is the very first time I’ve made a stuffing that’s different from the traditional stuffing recipe my grandmother always made. In my family, we eat the exact same stuffing every year for both Thanksgiving and Christmas. And I never get tired of it! Our stuffing is always made with the store-bought white bread cubes that come in a bag and then we add onion, celery, black olives, seasoning, and chicken broth. Sound a little boring? Maybe. But it’s delicious! But back to the sourdough. I have to tell you that I loved this every bit as much as my favorite family stuffing recipe. But it’s really hard to go wrong with sourdough, apples and bacon. Perhaps I’ll have to start a tradition of having two different stuffing recipes on the Thanksgiving table! Please use this recipe just as a guide, and adjust amounts to make it your own. 1. 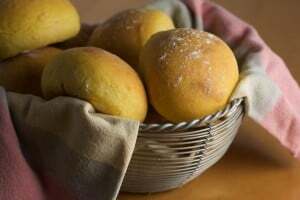 Spread bread cubes out on a rimmed baking sheet (or two, if necessary) and toast in a 350 degree oven until dried out and slightly crisp (10-15 minutes). Set aside. 2. In a large skillet, melt butter over medium heat. Add onions and celery and cook, stirring occasionally, until very soft but not browned, about 7 minutes. Add apples and leeks and cook for a few minutes longer until apples are crisp tender. Add sage, thyme, and poultry seasoning, stir and cook for half a minute longer, then remove from heat. 3. Transfer onion/apple mixture to a very large bowl, add chopped bacon and bread cubes, and toss well. Add two cups of chicken stock, toss well, then add more stock, a little at a time until the stuffing is well-moistened, but not soggy. Taste, and add a bit of salt if desired. 4. 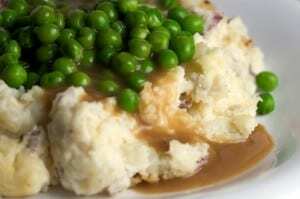 Pour stuffing into greased casserole dishes (mine fit into one 9×12-inch dish, but you can divide it if necessary). Cover with foil and bake at 375 degrees for about 30 minutes. Uncover and bake an additional 20 minutes or until the top is golden brown. Recipe Notes: *the leeks are optional. I used one in my first batch of stuffing because it was sitting in my fridge and needed to be used up. I think the leeks add a great flavor, but they certainly aren’t necessary. **I like granny smith apples because they are tart, and hold their shape when cooked. But feel free to use any apple that is good for baking. ***I ended up using just over 3 cups of chicken broth, but you may need a lot more depending on the moisture in the bread and your taste preference. 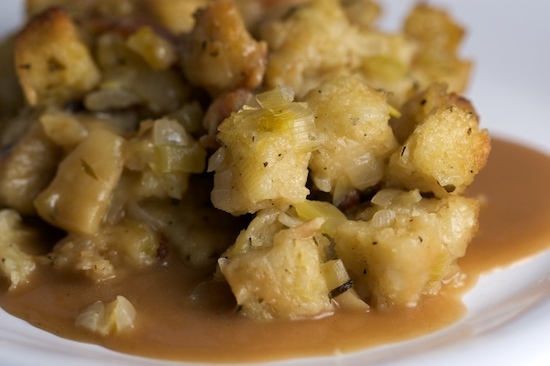 If you like a very moist stuffing, you might use even more than four cups of stock. Like all stuffing recipes, this one is more of an outline than an actual recipe. Feel free to adjust ingredients to your own taste. For more color, think about stirring in 1/4-1/2 cup fresh chopped parsley. For an interesting twist, you might even try throwing in some dried cranberries! And if Cornbread and Sausage Stuffing is more your thing, head over to What We’re Eating for Amanda’s delicious version! She used lots of delicious garlic sausage and homemade cornbread and I loved every bite of it, including the two days worth of leftovers! I hope you didn’t miss out on the earlier recipes from our Holiday Recipes with a Twist series. But if you did, it’s not too late to check them out now! Just click on the images to see the recipes. Be sure to tune in tomorrow for two different takes on cranberries. Happy holiday planning! sorry about your web problems! but man, this stuffing looks amazing. too bad thanksgiving is over for me this year, but who knows, i guess you can make stuffing any ol' time! I am very much attached to my own family's traditional stuffing. Though I'm generally very adventurous when it comes to food, I am always reluctant to try a different kind of stuffing, because I love my Mom's so much! That said, this sounds pretty tempting. I just might try it in a chicken in the near future! i don't think i can really stress exactly how much i loved this stuffing! the flavor that the sourdough adds to the bacon, er... stuffing... was out of control! we gobbled nicole's up as leftovers before we touch mine! definitely worth giving a whirl! my mouth is literally watering. yum. Is the recipe as-is more of a dry or wet stuffing? I wasn't sure from the description. And do you think I could substitute 1 lb. of loose herb sausage for the bacon? I love sausage in a dry stuffing, and I love sourdough. Would appreciate any thoughts/advice you have--my first time doing Thanksgiving! Hello from Portland OR! I just wanted to thank you for the holiday recipes that you posted. I made the sourdough stuffing and your friend Amanda's white bean soup for a Thanksgiving potluck. Both turned out great. You both have great things to offer to those of us who are looking to make something new and want already tried and tested recipes. Great site! Looks so good! I'm doing Thanksgiving for the first time and am trying to do as much prep the day before - can this stuffing be put together the day before then BAKED Thanksgiving day??? That would be awesome - one less thing for that day and something I can do the day before while everyone is out. I know I can at least prep the bacon though or chop some things if I can't actually put it together the day before. Thanks! 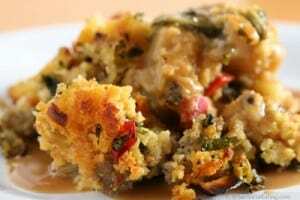 I have made this stuffing recipe for the last 5 Thanksgivings and it is always a hit! It will definitely be on the menu this year. 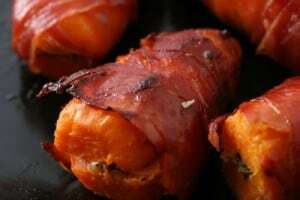 I have given the recipe out to friends several times as well. Such a great recipe!